Have a party coming up? Want to hire a DJ? We know there’s a lot of thought involved in all the planning, from arranging the food and drinks to your invite list or even the date. Having a party can be a stressful experience so our Local DJs simplify the music part of the equation. Ensuring that your guests are dancing and that you enjoy the music whilst transforming your venue into a light and smoke experience. In fact we’re so confident in our service that we’ll pay you R500 if we can’t get your guests dancing and give you our full DJ package for free. So get the party started and organise your DJ Entertainment in South Africa. Many people imagine hiring a DJ to involve having some snotty teenager showing up with his sound system for an evening of deep house. 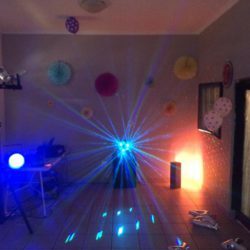 Our DJs couldn’t be further away from this offering a Mobile Disco Package in Johannesburg, Cape Town and Durban. This includes only the music that you enjoy, lasers, smoke machines, disco effects, microphones and a high quality sound system. Depending on your budget and the occasion choose a package that suits you best so that we can cater for your needs. Drop us a line about your requirements for your occasion and we can customise a quote for your needs. Then you can enjoy the party whilst your guests dance the evening away. So there’s a lot that can go into a kid’s party, from the cake to the presents, the friends, the balloons, the jumping castle, the…. But perhaps one of the key elements is keeping your kids entertained. We specialise in running party games and dancing competitions for all ages including musical statues, pass the parcel and limbo and the cha cha slide. If you’d like to Hire A DJ in South Africa check out our options and we can get the party going. Have a look at our testimonials to get a sense of how our customers have enjoyed our parties over the years. We are professional, reliable and punctual and will bend over backwards to ensure the best party experience possible. Give us a call to chat more about the specifics of what your requirements are, how many people you are expecting and what you require. Choose the right Mobile DJ in South Africa to have an awesome party.